Tim Visser has agreed to a two year deal with Harlequins, according to reports. The Scotland wing joined Quins in 2015 and has scored 28 tried in 53 games for the club. The Aviva Premiership side decided to extend the contract of the 30-year old for his performances. I am delighted that terms have been agreed for the renewal of Tim’s contract. Not only is he a proven try scorer at the highest level, he also is a highly regarded member of the squad, who embraces the environment we are continually striving to develop,” the club director of rugby John Kingston said. The captain of Harlequins and the former England number eight player has announced his retirement from the game at the age of 37. So far in his career, Easter has won 54 England caps and for Quins he has played 281 times, it is more than any other player. This forward player took the role of player-coach while working with the defense of Harlequins in April and he will now give his full time to coaching. The player played three World Cups and in his presence, the team Quins won their title of the first Premiership in 2012. Easter said,” I took time to think about my career when rugby director John Kingston offered me the role of player-coach. Preparations are in top gear for the first Test series game between the British & Irish Lions and the All Blacks of New Zealand. After their daunting humiliation of Chiefs in the midweek, the Lions have been in a fix over the selection of the squad to feature at Auckland. 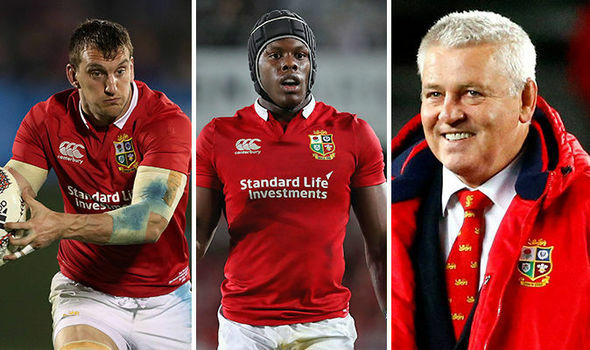 Warren Gatland, the coach of the Lions is worst hit as every tough decision is to be taken by him. The team list for the squad heading into the game in Auckland was released yesterday and several issues and slights have been noticed by rugby experts such as Nick Easter, Geordan Murphy and Will Greenwood. The first slight is the exclusion of MaroItoje from the starting list of the squad. Itoje has been remanded to the bench where he may likely come in as a sub. Itoje, who is the youngest man on the tour broke into the England team back in 2016 and so far has been named the IRB Breakthrough Player of the Year. He was instrumental to the successful tour of Australia as well as the carting home of two RBS Six Nations Championship. With his call up to join the Gatland’s squad, the youngster proceeded to play himself into what seemed like a certain spot in the starting XV for the first Test against the All Blacks. However, he would not be playing on Saturday as Gatlandinstead picked AlunWyn Jones, who featured in the 34-6 win over a second-string Chiefs side on Tuesday. The Lions would have to be careful in their approach during the weekend as the All Blacks remain as strong as ever, having won the last two Rugby World Cups, while succeeding at keeping defeats even for international games at the barest minimum possible. Nick Easter is currently in the news about a dramatic bungee jump that he has agreed to take part in as part of the finals of the European Cup. Whether his fans get to see him perform the feat or not, it surely raises hopes among his fans see their favorite ex rugby star in the field or when the finals are being played Murrayfield. For Nick Easter as well this would be an opportunity to be part of the action, even if he watches it off the field. It was not too long ago that he announced his retirement from the game. Having been a forward player for Harlequins and England, he decided to move to coaching which is a natural choice for many. At the age of 37 when he decided to retire, he had already played about 281 times for the club as well as won a total of 54 caps. He had been three world cup events when he played for England. When Harlequins were victorious in winning the title in 2012 Premiership league, he was one of the several players on the team who made it possible. His position was to be as a coach after retirement with Quins team. At the time of taking the decision he stated that being a coach and a player was hard work and hence he decided that he would not continue with the dual role anymore. This also opened up the opportunity to become a full fledged coach. He also feels that the opportunity to start off his coaching career with Quins was a privilege that he had obtained. Now that he is getting ready to be part of the Heineken challenge will be something unique that will get his fans to feast their eyes on him. This weekend, Saturday to be precise, will see England go head on with Australia, in a game that has been said would be quite an intense match. With England hoping to add one more win to their 13 so far, to make it 14 in a row, and Australia with the view of consolidating on their recent wins and a loss last weekend to Ireland, the stage is set for a huge game. Nick Easter, the former forward for England, who featured in 64 games for his country, and made about 184 appearances for the Harlequins, recently went on to analyze the upcoming game, picking three Australian players that he feels England would need to watch out for. “Australia are similar to Argentina in that England will face a side who want to play unstructured rugby but they are far more clinical in attack. Easter went on to mention the three players who he says are Israel Folau, TevitaKuridrani, and David Pocock. For Folau, who has 51 caps and 20 tries, Easter sees him as a dangerous attacking weapon in the Australian team, who is quite capable in the air. And he expects England to watch him closely. The second player, Kuridrani has 44 caps and 14 tries, and Easter says that the autumn series has seen the centre rediscover his form and stand out amongst the rest of the squad. Pocock, the third player, has 65 caps and seven tries with his position at the flank. Easter sees him as the guy that could cause the England team quite a lot of problems, especially when he combines with his team mate, Michael Cooper. Nick Easter, the 37 year old player for Harlequins, decided to quit playing the game in order to coach the side full time. He could not spend quality time on both coaching and playing for the Harlequins and hence decided to call it quits in July. Now, that he is relieved from being a player in the side, he can coach the team well and that too full time. Nick had accepted the role of being a player-coach of the team in April this year and was in charge of the defense. Easter took this decision of quitting the game and being a full time coach as he felt that he could not do justice to either of the jobs at the same time. He got some time to think about his career when director of rugby of Quins, John Kingston, gave hi the dual role. He was also an England rugby international and last appeared for his country in the 2015 World Rugby Cup. He feels that taking up coaching full time at this age is a very good option and he can give it his best shot. He has been a player for Harlequins for the past 12 years and now can make his own decisions. He says that he is thoroughly enjoying the role of the coach and is not at all wrong about the decision that he took. He is looking forward to working with the team and to share all his experience that he had in his 12 year old career as a player for Quins. Easter made a total of 281 appearances for Harlequins in his long career and joined the club from Orrell in 2004. He was most capped rugby professional in the Quins team. Kingston feels that Nick has seen great success in his playing career and will do so in his coaching stint as well. There are some players who need to decide how to retire from the field before they start sustaining too many injuries and have to retire in a defeated manner. For others, age and experience simply brings on more opportunities as they showcase leadership skills and the ability to take up responsibility for others. Nick Easter is one such name on the roster. Being of 37 years of age, he has been capped 54 times for playing for England and has played internationally as well as for the Premiership teams. Whilst fans might have hoped to have been able to see him having bough tickets through this link, they will now sadly be disappointed as he turns his career to off-the-pitch. Already having coached for an amateur team in Wimbledon in the last two years, he has now being appointed as the defense coach for Harlequins, the team that he presently plays for. He is the number eight player of the team but the new responsibilities will need him to juggle both duties, that of a player as well as of a coach at the Premiership club. The changes have been proposed by Conor, the director of rugby of the team who is on his way out. Though there are several changes being brought about for the club in the New Year, Easter is optimistic about the changes. He feels that there would be a lot of learning and he would also be making several mistakes. But he is up to that and would be looking to learn and develop his career as a coach in the new few years. It is often difficult for players to decide when to let go professional playing and for Nick Easter it just got easier. Being offered the role of a defense coach will help him move to a full-fledged coaching career in the near future. Till now he would be juggling dual roles. It would certainly be a challenge that he is looking forward to. Rugby leagues seem to be gaining prominence and they are emerging from the grassroots levels. Australian rugby has been one of the superpowers in the game and whether they win the summer tour or not against England this time, history will not change of the number of times the Wallabies team has showcased their rugby power to the world. The English tour has definitely showcased the developed skills and strategies that are being used by both teams who are playing at a higher level of competition than ever before. What Eddie Jones and his team is giving us is worth appreciating where no team will be knocked out at the initial rounds like last year. The game seems to be capturing headlines more and more in the world of sports. For instance, women’s games have been getting more attention and their successes are being showcased around the world. So is the Sevens team as HSBC team returns to have a great team in place in the world of rugby. The Olympics that looms ahead this year will be seeing a lot of countries scrambling to up the code so that they get an opportunity to play and to win Olympic titles in this game. There are certain differences that exist between rugby league games and the union games. The latter games have an international appeal but there is more talk and politics involved than true skills and the physical prowess that needs to be focused upon. These are points that need to be considered and to help develop the game to a true international standard across the world, in comparison to other games like football. Rugby is gaining importance in the northern hemisphere as well as it has been in the southern hemisphere. Many people are looking forward to working out careers in this game and it seems to offer sustainable career choices as well. Nick Easter takes on promotion to being the defense coach of Harlequins. He will be playing as well as coaching at this club. He admits that he will not be flawless, but he will definitely look out for the team. There would be challenges as Nick would be combining playing along with being a defense coach for Harlequins. Many players often find it difficult to decide when they need to give up their playing career. Some are lucky though to get it as they would like it. Nick Easter is one such case. He is 37 years of age, but he is strong on the field even then. He has been offered the position of being a defense coach for Harlequins. Hence, if he decides to quit, he can do so and continue to be a coach for the team. Graham coaches the team for the forward position. Graham Rowntree has become the forward coach for Harlequins which he will assume from the next season. He was formerly the forward coach for England. John Kingston will become director of the team at the same time. Nick is happy for the turn of events. He did not foresee, but he feels that it definitely helps him to take the decision to end his playing career when he feels like as he already has another assignment on hand. Most players who are nearing the end of their game are hesitant to stop playing and to give it up. They are unsure when to stop and feel that they still have some potential left in them. This would no longer be a problem for Nick. Though he did not see it coming, it is definitely a challenging new role for him, to be a coach and a player for the club which secures his future as well.